In 1985, John Keene began consulting with a machinery manufacturer that was interested in developing a reliable, inexpensive automatic splicer for the narrow-web newspaper press market. John’s expertise as a design engineer and director of development for two splicer manufacturers in northern Illinois made him the perfect candidate for this endeavor. John founded Keene Technology Inc, now known as KTI, a world-class manufacturer of automatic splicers, turret rewinders, and other web handling equipment. 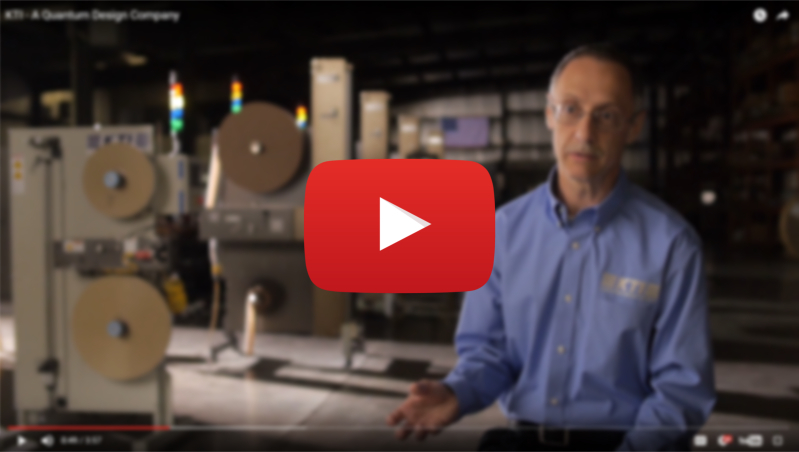 From the initial offering to the newspaper market, KTI has expanded to serve many web-fed industries including tag and label, printing, packaging, converting, envelopes, narrow web film, and more. Expansion of the customer base and product line has required KTI to upgrade their facility several times. To support heavy growth in the 90s, KTI expanded their facility to add a 22,000 sq. ft. addition that now occupies the state-of-the-art machine shop. The new facility was built to work in conjunction with the existing 65,000 sq. ft. manufacturing facility. This gives KTI the ability to dictate every aspect of the building process. The result is a facility that is able to adjust to the demands of the industry quickly and efficiently. In February 2014, KTI was purchased by Quantum Design Inc, a Controls System Integrator, located in Caledonia, IL. Under the leadership of the new President, Danny Pearse, and Vice President, Dave Culvey, KTI has already seen an extensive effort to improve product lines, release new machine models and accentuate focus on meeting the customers needs. In April 2018, KTI was officially merged into Quantum Design and is now operating as a product line of Quantum Design Inc.
KTI’s steady growth over the past thirty years is a testament to the equipment’s ability to maximize the production of virtually any web-fed process line. Although KTI’s products and services have expanded, KTI is still dedicated to the concept that got them where they are today; reliability, affordability, and a straightforward approach to doing business. As worldwide competition expands, printers and converters will have to take advantage of every opportunity to maximize production and reduce waste. That opportunity is efficient web handling equipment from Quantum Design’s product line, KTI. Get to know more about KTI, our products, customers, company culture, and what makes KTI so easy to work with.